A Texas bartending authority takes you on a tipsy tour of the best cocktails, bars, and distilleries of the Lone Star state. 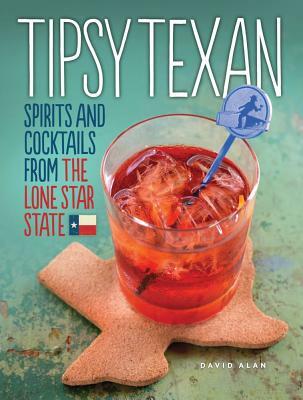 Tipsy Texan is a snapshot of the current Texas cocktail and spirit culture. Meet the bartenders who ushered in the Texas cocktail revival, and see the places where they ply their trade. Read about the distillers who have put Texas on the national craft distilling map, and all the wonderful cocktails that Texas bartenders (and bar patrons!) have devised in which to use these homegrown spirits. Join us on a tour of the gardens and farmers' markets that give Texans an incredible year-round assortment of fruits and vegetables, ripe for the picking—and ripe for the drinking. The book's recipes are organized by the way people drink: Big & Boozy drinks for when hearty, spirit-forward cocktails are the order; Light, Bright & Refreshing cocktails that will get you through those long, hot Texas summers; and Sweet, Creamy, and Desserty cocktails that will satisfy the sweet tooth. A section on techniques will reveal tricks of the trade, with each recipe accompanied by ingredient notes for anything out of the ordinary or that must be house-made. Recipes include the author's own creations, as well as classic cocktails with local and regional twists, such as the Old Austin, a Texas update on the Old Fashioned, sweetened with toasted pecan syrup. The Peach Tom Collins is a simple variation on the classic that tastes like Hill Country in a glass. As the summer recedes and the trees begin to bear fall fruits, the Harvest Punch showcases local rum, seasonal spices, and fresh pressed apple cider. Winter may come and go in the blink of an eye, at least in the state's southernmost parts, but there's at least enough time for a bowl of Absinthe Eggnog or a Golden Sleigh, an eggnog variation on the old Golden Cadillac. Succulent red grapefruits—the crown jewels of Texas's indigenous cocktail ingredients from the Rio Grande valley—figure prominently here. David Alan is a professional bartender and restaurant specialist who has spent more than 15 years in the industry. In 2007, David launched Tipsy Texan, becoming an early and outspoken voice for Texas's emerging craft cocktail and spirits scene. Since then he has worked on a number of bar openings, including the James Beard Award-nominated Esquire Tavern in San Antonio. David is a charter officer of the Central Texas chapter of the United States Bartenders Guild, a regular contributor to Edible Austin, and the founder of Tipsy Tech, a mixology course for enthusiasts and professionals. He has judged, organized, competed in, and won numerous cocktail competitions. David is a third-generation Texan and a graduate of the University of Texas. He lives in his hometown of Austin with his partner, Joe, Agnes the cat, and his dog/mascot, Jigger. He has served coffee and cocktails at venues as diverse as the Governor's Mansion and University of Texas tailgate parties, in barns and ballrooms, from Big D to Big Bend.